perfact weather, 2019. 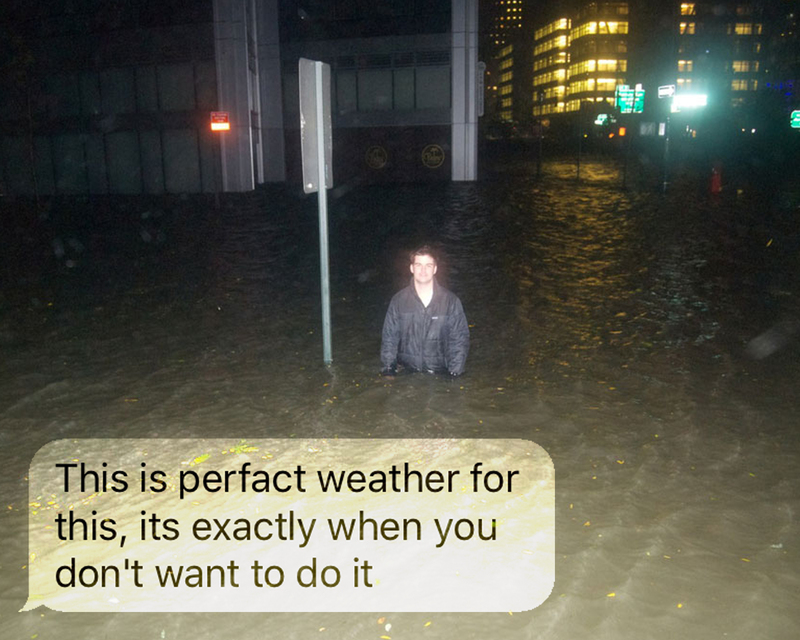 Image by Steven Geovanis taken during Hurricane Sandy, text from collaborating Survivalist (2018). In collaboration with Survivalists in and around New York City, we explore and embody the burden of threat as a means of opening up and revealing fragilities within our society, our ecosystem and ourselves. The Living emerges from a methodology of filmmaking: writing, composing, recording, and editing; collapsed with one of Survivalism: tracking, hunting, storing and moving. Overlaying these frameworks, we activate tension between “living” and “surviving,” constructing and performing emergency as a way to navigate myriad opposing forces in the twenty-first century. Constantly tracking the landscape (both environmental and technological), the Survivalist is uniquely alert to potential catastrophe. In “Landscapes of Emergency,” Rebecca Solnit writes that contemporary crises “tend to resemble cancers or viruses more than heart attacks. They have no definitive point of emergence and are often crises of disappearance or disintegration, systemic erosions, rhythmic lapses, nonstates. Having no clear point of emergence, they have no distinct point for intervention, only eventually a point of no return.” By visualizing, documenting, tearing open and fabricating this “point of emergence,” The Living invites viewers to examine their lives and the world around them through a lens of increased urgency and consequence. In Learning to Die in the Anthropocene, Roy Scranton writes, “the reality of global climate change is going to keep intruding on our fantasies of perpetual growth, permanent innovation and endless energy just as the reality of mortality shocks our casual faith in permanence.” The Living probes our notions of convenience, discarding the taken-for-granted in favor of more disruptive realities. Situating ourselves behind the lens of Survivalism, we examine mortality, the built environment, and the inconvenience of climate change. New York provides a backdrop for our constructed interventions and unfolding alter-narratives as we capture, track, test and experiment with various modes of Survival. ABOUT THE ARTISTS: Compelled by narratives of self-reliance, Annika Berry and Eliza Doyle frequently collaborate with those who define themselves as autonomous. With backgrounds in film and video, their individual practices examine identity archetypes, gender, religion, and power. In a 2016 collaboration (Mohegan Sun The Day Prince Died), the artists staged middle-of-the-night interviews in the hotel room of a Casino in Connecticut, disrupting traditional hierarchy between documentarian and documented. how to, 2019. 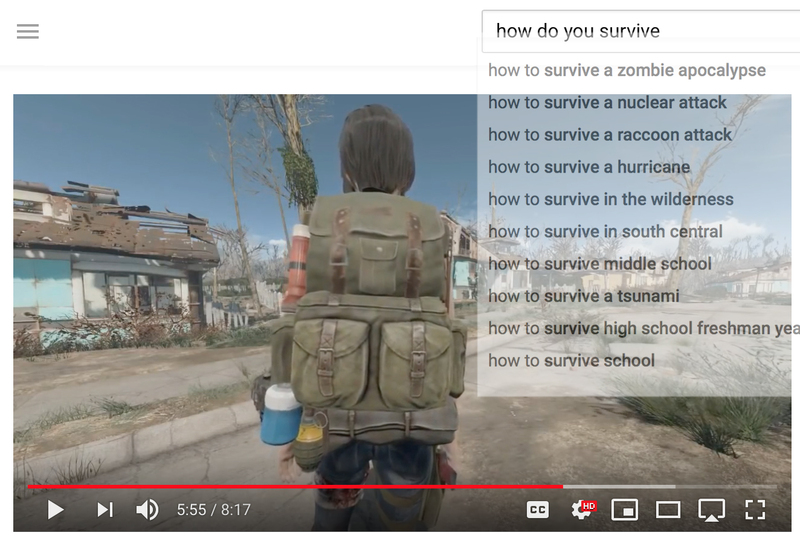 Screenshot, search bar, survival pack. failure to disappear, 2019. 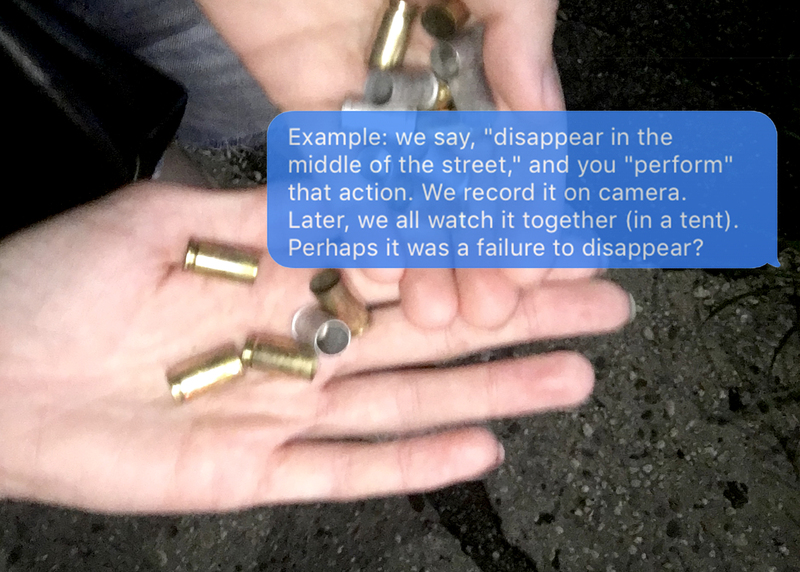 Bullets from Beacon, New York, text for collaborating Survivalist.